The Lac Laynes property is underlain by a North Easterly dipping volcanic assemblage with mostly felsic rocks in the north part and more mafic facies in the south. This sequence is cross cut by several diorite dykes and sills. The New Senator Caldera margin goes through the southern part of the property. The only known showing on the property (Lac Laynes-NO) was discovered by prospecting in 1990. Assays showed values of 0.99% Cu and 8.0 g/t Ag in a sulphide rich shear zone. In 2014, one hole (17931-14-02) drilled by Falco intersected a gold bearing tectonic breccia with values of 0.79 g/t Au over 14.0 metres, including 3.18 g/t Au over 1.2 metres. Since 1951, several exploration surveys were carried out on the property including mapping, geochemical sampling, airborne and ground geophysics as well as 49 diamond drill holes. 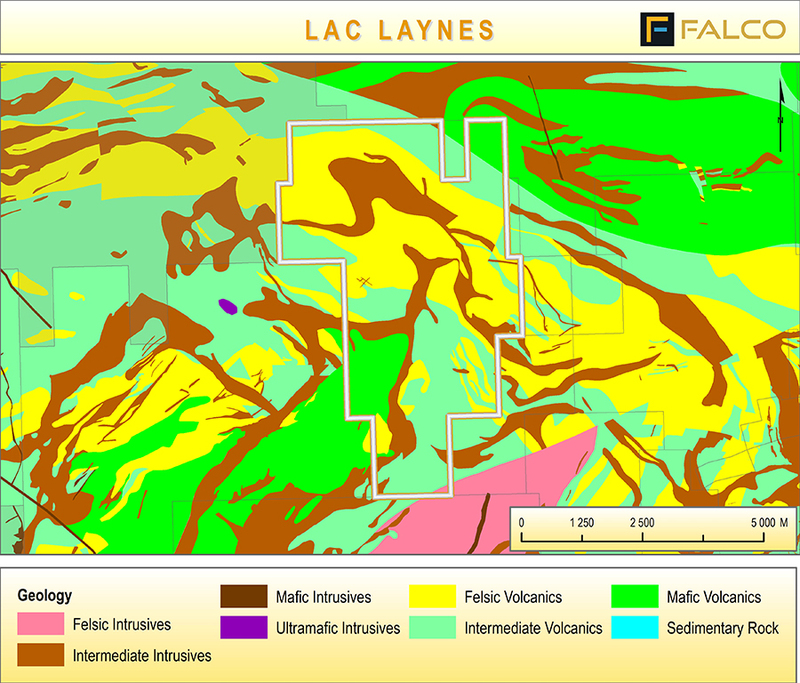 The Lac Laynes property is a Greenfield exploration project and consists of 65 claims covering an area of 2,605 ha. It is 100% owned by Falco Resources. The Lac Laynes property is located in Duprat Township, about 25 km North West of the city of Rouyn-Noranda.